Track gauge is measured between the inner faces of the load-bearing rails. Gauge matters because all of the equipment running within a network needs to have running gear to match the gauge. The U.S. standard railroad gauge is 4 ft. 8.5 in. Maine had a unique system of narrow gauge railroads on track just 24 inches apart developed to lower the cost of railroad construction and operation, allowing them to be built in areas where it would not otherwise be economically feasible. At their peak, the Maine Two-Footers operated on over 200 miles of track transporting both passengers and freight in and out of rural Maine. They played a key role in the timber industry as well as early tourism efforts. These companies were the smallest narrow gauge common carrier railroads in the United States. The museum operates a fleet of steam and diesel locomotives, along with vintage and replicas of Maine narrow gauge rolling stock, on over three-quarters of a mile of two foot gauge track. In addition to riding the train, visitors experience two authentic train stations (1912 Freeport and 1871 Thorndike) as well as 12 other buildings from Maine railroads including several car houses and a very unique octagonal crossing shanty once located in Portland, Maine. The Maine Narrow Gauge exhibit contains the story through words, photographs and artifacts of the unique history of Maine and the two foot railroads. Included are rare artifacts from the many Maine two foot rail lines. Around 1940, Ellis D. Atwood started buying up locomotives and rolling stock from defunct Maine narrow gauge railroads creating the Edaville Railroad on his sprawling cranberry farm in South Carver, Massachusetts. Today, much of that equipment has been returned to Maine and some of it lives here at the Museum. But in 1964, Museum Founder George McEvoy wanted to find a narrow gauge steam locomotive and managed to do so through the classifieds of Trains magazine. He imported a German-built Henschel #12313, built in 1913. Today, the museum operates three Henschel steam locomotives (c. 1913–1938). These particular engines were originally used on short lines for railyard and construction work. The engine configuration is 0–4–0, meaning no pilot wheels (leading wheels) and no trailing wheels, only four driving wheels. Our steam locomotives are fired with coal and operate with a boiler pressure of 100 to 150 psi. The water is stored in the frame under the boiler, between the wheels. Each locomotive weighs approximately 10 tons. Joining the fleet for 2016 is a 1940s Whitcomb diesel locomotive. Although historically the Narrow Gauge railroad lines didn’t last long enough to convert to diesel, the Maine Central and Belfast & Moosehead standard gauge railroads (which our historic stations and associated buildings served) did. Diesel locomotives gained favor with American railroads starting in the 1930s. They were easier and cheaper to operate and helped the railroad industry continue to compete with trucks, planes and automobiles. 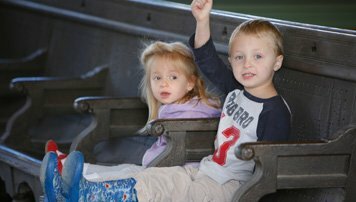 Whether powered by our steam or diesel locomotives passengers ride aboard vintage and replicas of Maine narrow gauge rolling stock, on over three-quarters of a mile of track. Feel free to visit the Museum’s car barn to see any equipment not in operation during your visit. On some days, instead of a train ride, guests are invited to experience special historic rail equipment. The 1925 Model T was converted into a crew car for the Sandy River and Rangeley Lakes Railroad at Phillips, Maine. A motorized inspection car was a significant upgrade from the earlier hand cars that were used to transport tools and workers to locations on the tracks that needed repair. It is on loan from the Owls Head Transportation Museum in Owls Head, Maine. That same year, the SR&RL built a 12-passenger railbus to accommodate dwindling passenger counts. The bus was originally built using a REO truck frame and motor. In 1936, when the SR&RL was abandoned, it was sold and later given to the Bridgton & Harrison Railroad, where it operated from 1937 to 1941. When the B&H failed, it went to Edaville where the REO parts were replaced with equivalent from a Model A Ford. It operated at Edaville until 1961 when it was wrecked at a grade crossing. It was restored and returned to Maine nearly 20 years ago but has rarely operated during that time. It is on loan from Maine Narrow Gauge Railroad Co. & Museum in Portland, Maine. This building, on the right, is another track maintenance building used to store small railcars often called motor cars or speeders. These vehicles were used by the track crew to inspect and maintain the track. This building was part of the Belfast and Moosehead Railroad and arrived here in the early 1960’s. It houses Maine railroad signs, furnishings and the Station Agent’s office. The Station Agent office accurately reflects the activities of that post. There are rest rooms located here with entrances at the side and back of the station. The caboose was the conductor’s home/office and the center of operations on the train. Railroad workmen riding long distances would sleep and eat in the caboose. It contains all the necessary comforts: ice box, water storage tank, sink & storage units round out the kitchen. Up above is the monitor, also known as a cupola. This was a lookout station for smoke from overheated journal boxes (wheel bearings) or other signs of trouble with the train or the track. This unique structure was the gate tender’s quarters at Woodfords Crossing in Portland, Maine. Before automated crossing gates, crossings were staffed with people to hand operate the gates.